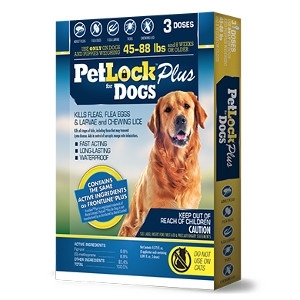 PetLock® Plus for Dogs 45 - 88 lbs. PetLock® Plus is a monthly spot on treatment and preventative that kills fleas, flea eggs and larvae, chewing lice, mosquitos and ticks and aids in the control of mites. PetLock® Plus for Dogs has the same active ingredients as the leading fipronil-based brand for Dogs, but sells for a fraction of the cost. PetLock® Plus is fast-acting, long-lasting, waterproof, and easy to use. Apply monthly.